Somtow's World: "Our Ways Are Not Your Ways"
I can't resist sharing this on my blog as it is I this it is something that penetrates to the very heart of what it means to be Thai. Always in a delicate balance between futurism and feudalism, with one foot in cyberspace and the other in the Stone Age. 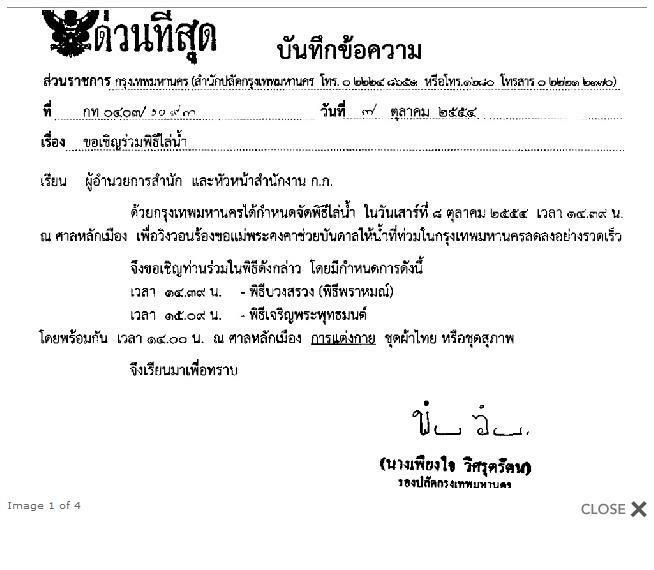 It appears to be an official notification (with a government seal) inviting people to a special "water-driving-out ceremony" to be performed in order to help quell the flooding. Now, the Emperor Caligula once went to war with Neptune, and staged a huge triumph in Rome where the soldiers carried heaps of seashells as trophies of the victory. However, not many people bought it. Indeed, Caligula was assassinated. King Canute, 1,000 years later, had a better idea. He performed one of those "ruler of the waves" ceremonies, and when it didn't work, declared that no king was as powerful as God, and used it to teach his subjects a lesson in self-awareness. 1,000 years later, the City of Bangkok - after Rome and Britain the new center of the cultural universe - has been doing it too. 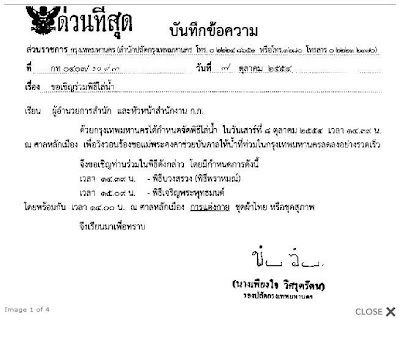 Now the Governor of Bangkok is my childhood friend, but he didn't have the advantage of my Cambridge education. He only went to Oxford. So he can be forgiven for allowing this superstitious twaddle to be perpetrated under an official seal. And who knows, it might even work! We'll soon see next year, when Bangkok survives the apocalypse and the rest of you guys are carousing with Davy Jones.